Asking about rates and overall cost of end to end interior designing services in Delhi is a very legit question, especially when you are involving an interior contractor to design your home or office on turnkey basis. A turnkey project requires proper planning and budgeting and if you fail to budget the expenses properly in advance, it can be really difficult to manage and execute the project. In recent times, the demand of interior designer services in Delhi has increased. Off late we have started realizing the benefits of getting the home or office properly designed and decorated before moving in. Apart from proper space planning and utilization, a properly designed home or office can simple increase your efficiency and make you feel happy to stay/work there. And that’s the reasons that more and more people are hiring interior designing services in Delhi NCR and other cities across India. In fact we have started seeing interior designing requests coming from smaller cities and towns these days. Why rates of different interior designers in Delhi can vary? Now, as far as the rates of interior designers in Delhi NCR are concerned, the best way to get tentative estimates for interior design and decoration is to invite the interior companies or interior contractors to your place and discuss your detailed requirements. Because as you know, when it comes to interior design cost and budgeting, there are various things that need to be considered. Starting from the carpet area of your home, to the extent of work that has to be done and the quality of materials and craftsmanship you need every single thing is equally important and can affect the overall interior design cost for your home or office. The one fit all model does not work here, and the amount of money you want to spend on a standard 3 BHK interior design in Delhi may be more or less than what others are spending on same kind of project, within your block or society. There are all types of materials available in the market, whether you talk about the tiles and marbles, plywood, glass or faucets; there are wide range of materials available and what fits or suits you and in your budget is of highest importance. What generally happens is that when you contact any interior designer in Delhi, they generally like to visit your home, meet you face to face and discuss your functional requirements, taste, theme and budget. Based on your requirements, budget and input that you have provided the interior designers will plan everything and try to meet your requirements within the specified budget. Now if you want to get the interior designing work done on turnkey basis, then the interior designers will give you an all inclusive estimate and quotations. This includes designing, sourcing and production. Obviously, this is the best way to engage a professional as they are going to take empty flat, work on it and deliver you the fully furnished flat. You don’t have to bother about materials sourcing or anything, they will take away all the pain. But you can also hire them just as a consultant. In such engagement, they will take the measurements and based on your requirements and lifestyle needs, they will design the project in high definition 3D images. You will be able to look at the finished rooms in image even before they commence the work. Once you like a 3D concept and idea, they will deliver you the images in digital as well as in print and along with this design, they will give functional measurement, that you can directly take to carpenters and other contractors who are supposed to work on your project. Of course the execution will be on you and you have to source materials etc and get it done as per your convenience. Of course the rates for only consultation are way less than the end to end engagement. Even if the rates of interior designers in Delhi will be different based on your requirements, quality of make and materials being used, expertise and experience of the interior contractors, listed below are the standard rates and charges of interior designers in Delhi NCR. This rate chart may vary based on how you engage and who you engage to work on your project, but this should give you a fair idea of tentative rates and charges and it’s going to help you budget your project. I would like to reiterate the fact that the above rate chart is for general understanding and to help you figure out a tentative cost and budget of interior designing in Delhi NCR. I strongly advise you to consider taking quotations from a couple of professional interior designers in Delhi before you finally hire an interior designing company. Their rates may be a little less or more based on the factors we have already discussed. Well, apart from getting an aesthetically pleasing and spacious home or office designed by an interior designing company, there are a whole lot of benefits of hiring interior designers in Delhi. Listed below are a few of the major benefits of hiring interior designers to design your home or office in Delhi NCR. Firstly, believe me or not, hiring an interior designer can actually help you save your money. Wondering how? Well, the reason is, when you try to design your home by yourself, most of the time you get confused and end up overdoing and overspending on the work. After all, when you go to the market, there are so many designing products there, so you are bound to get confused unless you are an expert and know what to choose. Your are most likely to buy goods that looked stunning in store and when you place the same in your home, it won’t look that good and it may be a complete misfit at times. In contrast to that, there is no unnecessary cost when you hire a good interior designer. They will advise you to invest only on things that are absolutely necessary. They will create high definition 3D images of the finished rooms and when you approve the look and style, they will only use those many furnishings and décor elements which eliminate the chances of overspending. The experienced interior designers have got good contacts in the market and so when they refer you to somewhere, it means that the materials you buy from there will be of excellent quality. They actually can refer you to the right kind of suppliers where you are going to get the good quality materials within your budget. Generally, in case of renovating or designing the home, you got to deal with various people starting with the architects, the laborers, painters, carpenters etc. which is often not that easy. But, with an efficient interior designer around, you need not worry so much because they are pro as far as communication goes and they will do these on your behalf. When you are decorating your home, in most cases you need to run here and there from one market to another to purchase the materials (both raw materials and finished decorative items). But with interior designers to your aid, you can actually save a lot of your precious time. In fact, the interior designers in Delhi have got a really good sense of what to buy and from where to buy, so this automatically help you to save your time, as they will take care of sourcing of materials. Needless to say, the outcome will be just stunning. The interior designers have an aesthetic sense and so they can actually help you get a home that you desire. This is because they are the only ones who can actually understand what you exactly want and then reproduce it in the same way. There is no chance of any mistake and you are gifted with a dream home that you have so long desired. They have experienced technician and carpenters and they know how to work based on the specification and measurements as provided by the interior designers. They will also have a site supervisor who is going to keep a track of everything and ensure that production is being handled as per the design and specification. Now, that you know the standard rates of interior designers in Delhi NCR and also know how beneficial interior designers can be for you, I am sure you are wondering about how to hire the best interior designer in Delhi. Well, the usual way is to google it. But then, you will get hundreds of listing, have to make several random calls and then ask for estimates. And this may not be the best way to hire an interior designer in Delhi. But you can use Servicesutra to quickly connect with three of the best interior designer in Delhi NCR. Whether you are in Noida, Greater Noida, South Delhi, Gurgaon, Faridabad or Ghaziabad, you can use Servicesutra to request free and competitive quotes and estimates from leading interior designers. All you need to do is to call our helpline number 07044123404 or submit the free quote request form. On submission, you will receive call and offers from up to three different interior designing companies who work across Delhi NCR. You can meet them face to face, discuss your needs, compare their quotations and the based on your best judgement; you can work with the interior designer of your choice. Earlier, people did not have so much scope to decorate their homes by taking professional help. But, now, times have changed and with the high demand to professionally design and decorate the home, we today have a decent number of interior designers in Delhi NCR. Delhi is one city that is quite popular when it comes to interior designers and with an increasing population there, we do get a lot of interior designer requests from the capital. Many of the users are unsure about the rates and the most obvious questions they ask us are about rate and overall interior design costs in Delhi NCR. 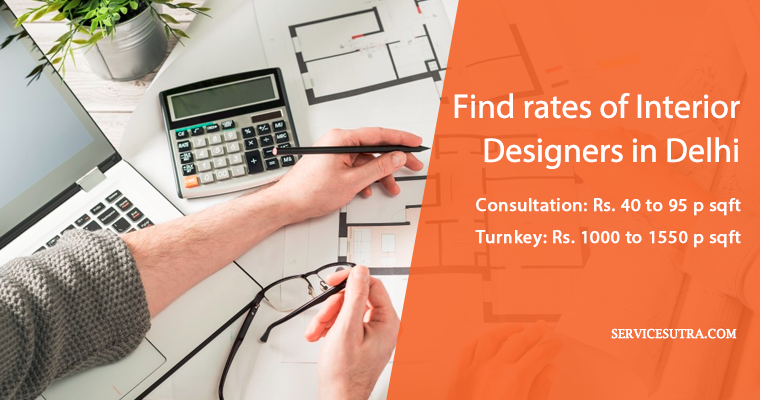 The best way to check rates for interior designing services is to have a face to face discussion, but I have shared a standard rate list to help you figure out the budget. This rate chart should help you get some idea of the costs s per your functional requirements, quality of materials to be used and overall finish of the project. What else do you think one can do to find the rates and charges of interior designing services in Delhi NCR? Have you ever hired an interior design company in Delhi NCR? Would you like to share what worked for you?